On Sunday, Jan. 19, 2014, there will be a momentous gathering in downtown Sewanee to mark the 50th anniversary of the desegregation of the Franklin County school system, as part of a series of community-wide events surrounding Martin Luther King Jr. Day. Last spring, the Sewanee Civic Association (SCA) began working on plans to honor the 50th anniversary as a tribute to the Sewanee community and eight local families who played a major role in the historic integration. During the early to mid-60s, there were numerous lawsuits nationwide regarding desegregation; however, the local suit was unique in that there were four black and four white families working together; for this reason the NAACP and its legal defense fund embraced the suit. Additionally, to further strengthen the case for integration, the Sewanee community banded together to provide funding for construction to enlarge the physical plant of the school, as well as facilitating a tutoring program to ensure that all students would thrive in the newly integrated public school. In 1964, the U.S. District Court issued an order to desegregate the schools and August of that same year saw the system begin to assimilate all children into the classroom regardless of race. A permanent and officially sanctioned Tennessee State Historical marker to be placed at the Sewanee Elementary School (SES) was unanimously approved by the SCA as a first step of commemoration. Despite rigid guidelines, the marker and suggested text were endorsed in the first round of subcommittees in Nashville and approved by the full Historical Commission in October. 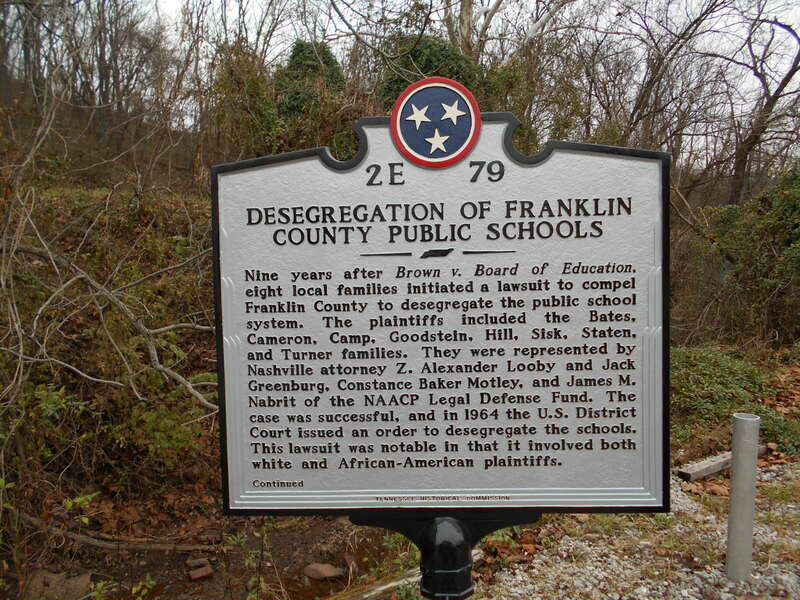 Linda Wynn, assistant director for state programs for the Tennessee Historical Commission and a civil rights educator, indicated the uniqueness of the suit and suggested added language to the marker as a highlight of its importance. The marker is in final production at Ohio-based Sewah Studios and will be erected on University Avenue prior to the January ceremony. The group that bonded to make history were the African-American families of Hill, Sisk, Staten and Turner and the white families of Bates, Cameron, Camp and Goodstein. In January, members of those families, including Robin Bates, Doug Cameron, Marvin Goodstein, Juliette Larkins and Sandra Turner Davis, are planning to speak, as well as Vice-Chancellor John McCardell. It is hoped that Wynn from the Historical Commission will also be present, along with former Sewanee community member and previous SCA president and fund-raiser for the public school expansion, Felder Dorn from New Jersey. Also expressing interest in attending is former University chaplain, the Very Rev. David B. Collins, Dean Emeritus of the Cathedral of St. Philip in Atlanta. His daughter Melissa, who was in the seventh grade at the time, has begun work with Barbara Reid Bedford to organize their entire class to reconnect and attend the event. Local school board officials are also expected to be present, along with SES principal Mike Maxon and others. The program will commence with the majority of speakers inside SES and will move outside for the marker’s unveiling and dedication by McCardell. At the conclusion, all will cross the street to enjoy a reception in Brooks Hall at Otey Parish. Otey Parish was instrumental in forging community relationships for the tutoring of many students prior to enrolling at Sewanee Public School (as it was called then), and it was due to devoted School of Theology students and spouses that the adjunct teaching program reached its ultimate success. Leading the SCA planning efforts have been Elizabeth Duncan, Susan Holmes and Cameron Swallow, with help from Frank and Barbara Hart and Barbara Schlichting. This entry was posted in Project and tagged Desegregation, Historical Marker. Bookmark the permalink. It is great to celebrate this moment in history. Sewanee is surely one of the most forward thinking communities in the area. It is particularly important to celebrate diversity in a community that still is lacking in it, and in light of the fact that the college was historically an institution conceived for educating solely wealthy white males, and whose principal founders (like Polk) who fought to preserve a social racist order. when Desegregation took place during the 1966-67 school year. It was a very smooth transition in all areas of the school’s culture. We had a wonderful group of 9 – 12 students who became a part of history being made. Lasting friendships became a major result of this historical event.